WhatsApp Group Chat – Should personal statements of candidates be given more importance than qualifications? The advancement in technology has undoubtedly brought people closer together. As a result we have become more globally connected. While the internet serves as a very good tool for getting connected and being connected with your friends and relatives; whether close and far off it should be noted that it is also an exceptional tool for recruiting too. 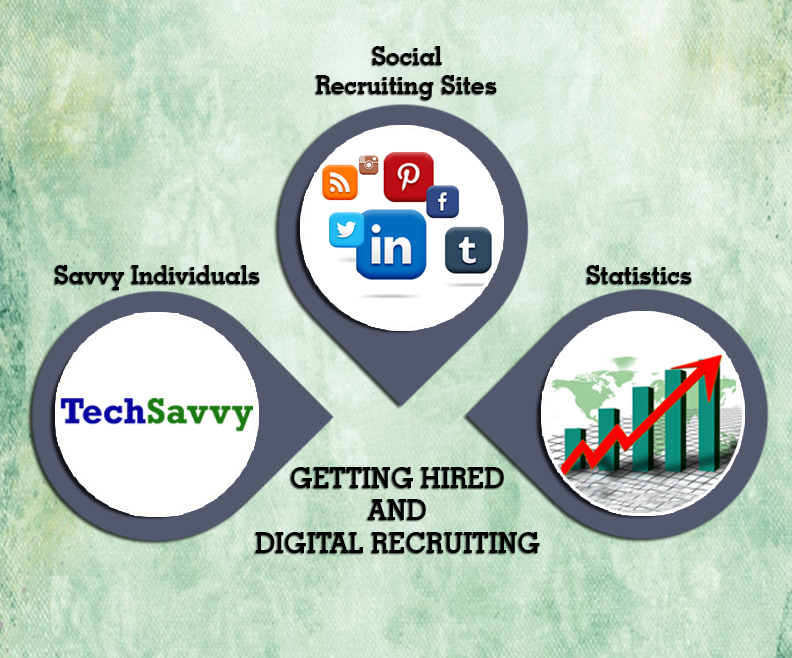 Modern recruiters now focus on social media recruiting and sourcing therefore a job seeker’s first impression is no longer done during a personal interview but rather through social networks such as Facebook. So if you have an online presence it is essential that you watch what you post and display as recruiters relay on these platforms to get a first impression of a potential candidate. Several studies have been conducted and the statistics in recruitment showed that 30 % of all google searches are mostly job related, 94% of recruiters either use or plan to use social media for recruiting, close to 78% of recruiters have already hired via social media, over 1 billion endorsements are done on LinkedIn and 93 % of recruiters now look at social profiles. Lately a new trend is followed in recruiting with 43% of job seekers now looking for and applying to jobs through mobiles. 73% of job seekers within the age range of 18 to 40 year olds have used social networks and landed their last job via these platforms (careerenlightenment.com). Of the several social media sites the top and the most used by recruiters due to the results obtained are LinkedIn with 94%, followed by Facebook with 65%, in close competition to Facebook is Twitter with 55%, followed by Google+ and YouTube with 18% and 15% respectively. In addition 94% of recruiter’s use Social media for their own job hunting (careerenlightenment.com). Be careful of the information you share and what you do online, as there are lots of fake job search sites that use your information for illegal use. Besides be prepared for someone checking up on you. Use a separate email id for job searching or create one that doesn’t say too much of you. Make a simple one such as your name@email address.domain. There are chances that a potential employer will check up on your social media site, so be sure to add information regarding your volunteer work and work experience. Don’t conduct your job search at your current employer’s expense, as many companies monitor your computer use and email and will know if you are job searching instead of working. These are some tips that most individuals with an online presence tend to forget or don’t pay attention too. 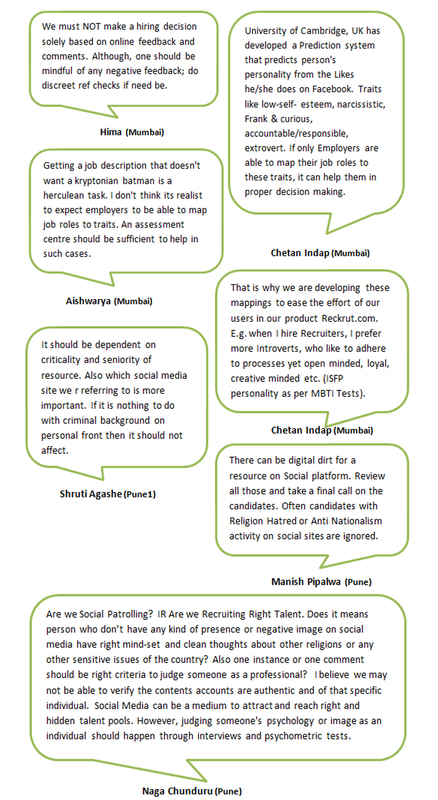 So if you are a sourcer, recruiter or simply a job seeker you too need to focus on these aspects as it has a bearing on future career prospects. If you are someone who still relies on traditional methods of recruiting its probably time to wake up and be In with the crowd as your chances of acquiring a job via traditional methods is rather miniscule. As you need to adapt to modern methods of recruiting if you want results and speed up the process. 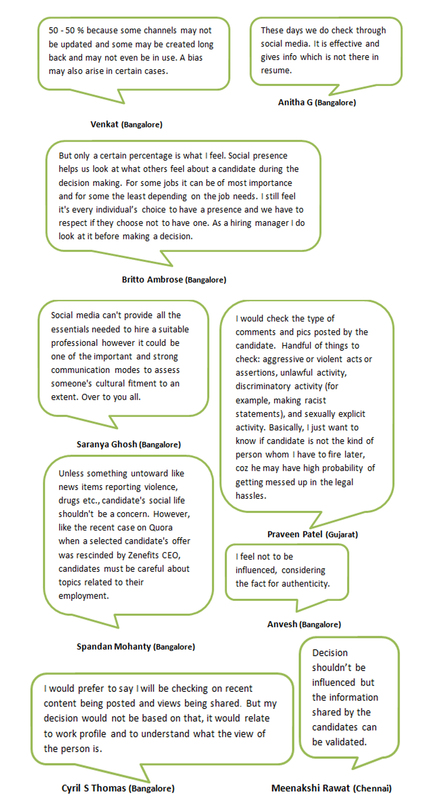 WhatsApp Group Chat – Should hiring decisions be influenced by candidate information on Social channels? 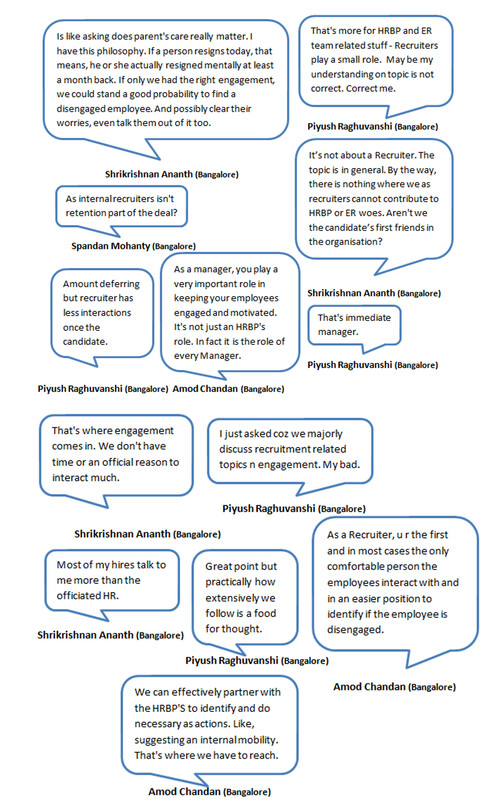 The WhatsApp Group Chat discussion that was held tuned out to be quite informative for all Talent Acquisition Professionals present. What’s more we had a plethora of perspectives expressed and all present benefitted. It is said, “Learning never stops”. And coming across interesting conversations like these has proved that it still holds true. Don’t you agree? Besides it’s for reasons like this that having a forum where like-minded individuals can come together to interact and share their views that helps us all become better learners. Hence, the discussion on, “should hiring decisions be influenced by the candidate information on Social channels?” was a success. So let’s find out what the discussion was and enlighten ourselves in turn. Sounds great, doesn’t it? This brings our amazing conversation to an end. The success of this one only makes us realise that we can look forward to another worthwhile discussions next time around. Be sure to join us by following @SourcingAdda for more inputs from Thought Leaders that is sure to alter the way we look at things and the information that we already know. Companies are constantly seeking out talented individuals, to build and grow their individuals business. In times when talented and skilled labour isn’t easy to come by, especially when such individuals are in demand by several companies be it; a small start – up, a growing business or a big business. It’s safe to say that a recruiter’s task is never ending as candidates who have been great employees but have received better packages. Recruiting is the most daunting task or job profile if gathering candidates isn’t as easy as you hope it to be. 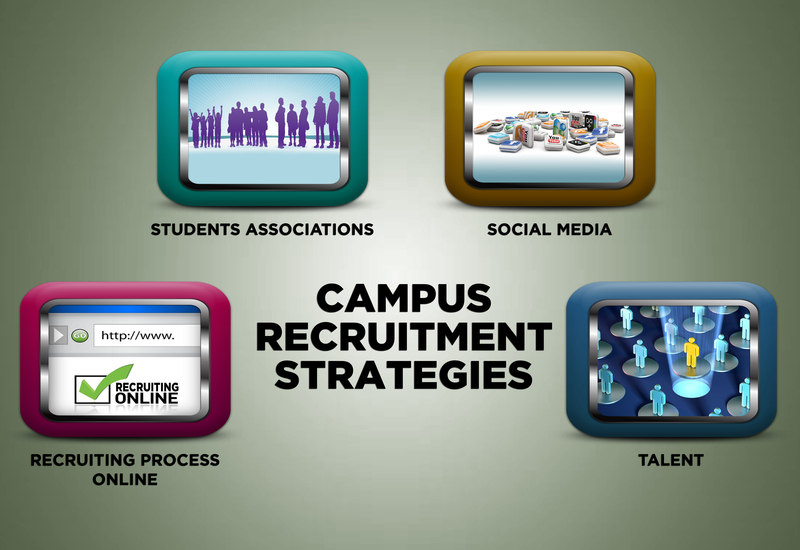 Luckily there exist “4 More Campus Recruitment Strategies, Recruiters need to be aware of” that are also out of the box ones. Let’s find out what they are. While career or On – campus events allows hiring companies to recruit fresh talent working with students associations gives you more exposure to catch talent in the making. What this means is that you can meet students before they decide on a career path and advise them according to their interested field. This will help them to get a clear idea about their choices and the kind of degree they should go in for. Or they can also pick students that have some experience in their field of choice even if they do not possess the specific degree. Nowadays, most students are relatively active on social media sites. So you can get their attention by analysing the kind of sites that have the maximum amount of students and then post job specs. This will definitely boost your applications and responses to your posts, thus you are likely to get more candidates from which to make a selection. Here you can also advertise any events that are related to recruiting that your firm is conducting, for instance hosting career fairs or introduction sessions. You are bound to have more success when you go online as most of your applicants that you wish to catch are within the specific age range that are regularly active on social networking sites. 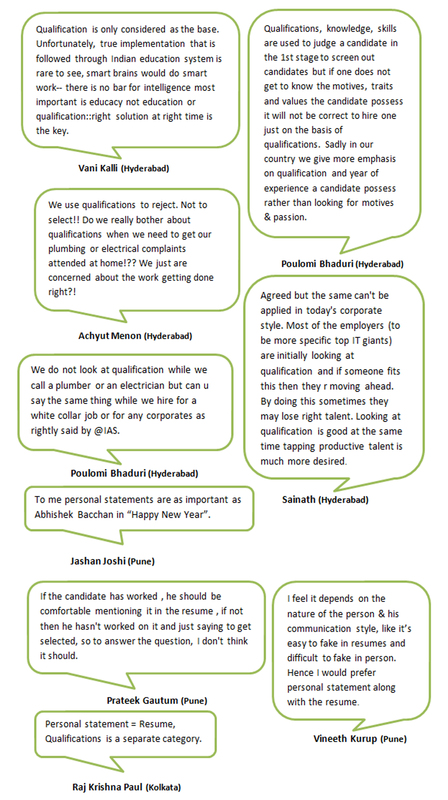 So posting on, online platforms or job portals will help you get more candidates fast. Avoid asking students to fill up scraps of paper at job fairs and use modern methods of seeking the information you require by using technology instead, such as mobiles or iPads. This way all the data is stored in one place and when you require candidates you can simply sift through this data effectively and efficiently and thus speed up the entire process. These options are far better and more effective ways to attract and capture the right talent that too with a mere click of a button. Therefore, get the desired talent that you seek by cost effective methods and by following the trend that is followed. So the next time you pick your method to capture talent remember to, “Be willing to step outside your comfort zone once in a while; take the risks in life that seem worth taking. The ride might not be as predictable if you’d just planted your feet and stayed put, but it will be a heck of a lot more interesting.” – Dward Whitacre, Jr.
WhatsApp Group Chat – Does Employee Engagement make a difference? If you’ve been updating yourself then you too would have heard a considerable amount of talk flying around about Employee Engagement and its importance. In view of this latest development we at Sourcing Adda (@SourcingAdda) decided to find out more perspectives about this interesting topic and hence our WhatsApp Group Chat topic catered to this particular aspect. And here’s what went on in this discussion….. This brings us to the end of our interesting discussion be sure to join us for the next one. 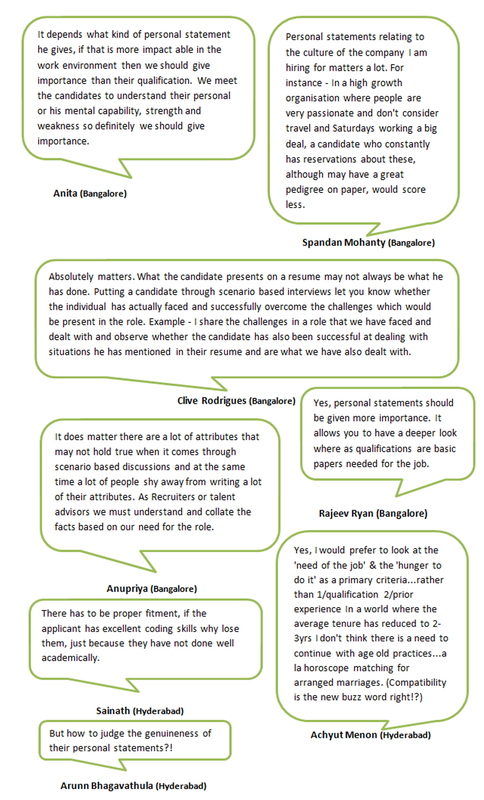 If you’re looking forward to more such discussions then follow us @Sourcing Adda (#SourcingAdda).